The story of the Glaslyn Ospreys started back in 2002 when it became apparent to the seasoned birdwatchers of Porthmadog that an osprey was summering in the area. This was not a particularly unusual sight, as individual birds had been known to have summered in Wales before. However the following year, during the summer of 2003 a displaying osprey was spotted. More significantly, two ospreys were witnessed either together or, at the same time, in different locations of the valley. At that point it was too late in the season for breeding to take place, but these sightings offered great hopes for the following year. April 2004 again saw the presence of two ospreys in the valley. These birds were traced back to the wilds of Nantmor but, despite questioning local farmers, a nest could not be located. On the evening of 18th May a passing cyclist, Steve Watson, spotted an osprey flying upstream and carrying a fish at Pont Croesor. Steve promptly contacted local community policeman and birdwatcher Kelvin Jones. Kelvin had no knowledge of a nest in the area but reported that in all likelihood, if a nest were present, it would be in the Nantmor area. The following morning Steve was back on the phone to Kelvin reporting that he had found the nest. After the initial excitement of discovering the nest, came the realisation that any eggs would be at risk of theft by egg collectors. These were the first ever pair of ospreys to be officially recorded breeding in Wales and their eggs would be highly prized and extremely vulnerable. Reg Thorpe, Head of the RSPB Cymru Conservation Team, was contacted and a monitoring scheme was organised. 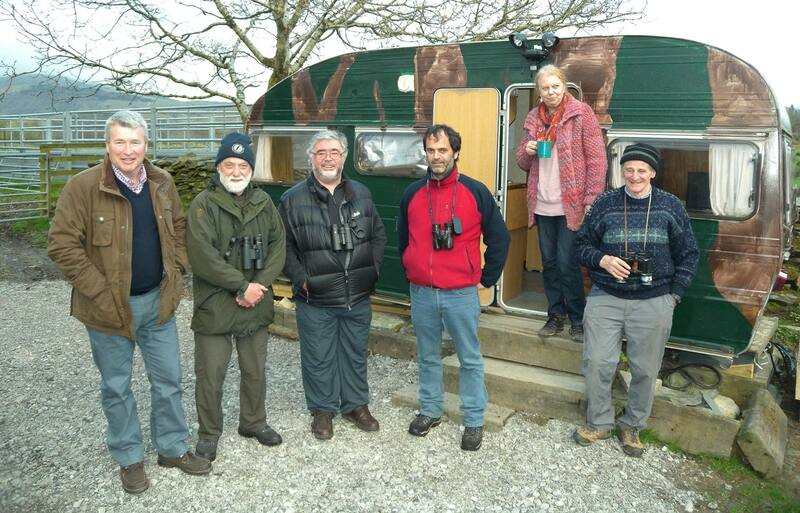 Members of Cymdeithas Edward Llwyd, Wales Raptor Study Group, Cymdeithas Ted Breeze Jones, Glaslyn Birdwatchers, Cambrian Ornithological Society, Countryside Council for Wales, the Environment Agency, Snowdonia National Park and the RSPB volunteered to help and a 24 hour watch was set up at the nest site. The site was quite basic initially, just a camp chair and a borrowed telescope. Three weeks later the loan of a touring caravan offered more luxurious protection facilities. News of the nest started to spread around the locality and it was becoming increasingly difficult to contain this spread. Plans were put in place for a public viewing area at a safe distance from the nest. Carl Nicholson, the former head of the RSPB Midlands Region, was drafted in to oversee the viewing site. He was joined by Glyn Roberts and Jim Beattie, regular volunteers from RSPB Conwy and Leighton Moss respectively. The viewing site was a simple fenced off area next to the bridge at Pont Croesor. On the 28th June Kelvin accompanied a wildlife cameraman to the side of nearby Moel Ddu and footage of the nest was recorded. This video revealed that the female was leaning into the nest feeding something, followed by a white blob shooting over the side of the nest. It seemed that at least one chick had hatched. The date for the official announcement of this hatching was planned for Saturday 3rd July on the BBC Radio Cymru programme Galwad Cynnar. However, the 30th June saw an unseasonably fierce storm. Tragically the nest collapsed and two dead chicks were found under the tree. The post mortem revealed that the chicks had died from injuries sustained in falling over 80 feet from the nest. It was suggested that they were around ten days old. However, both of the chicks had lost their first down and it is more likely that they were around 12 to 15 days old. The public viewing continued as planned and attracted 9,500 visitors over the eight week period of opening. Good views could be had of the osprey pair continuing to rebuild their nest, despite the fact that it occasionally collapsed again. At this point it became apparent that something would need to be done to help the pair to breed successfully the following year. The female was unringed, but the male wore an ochre coloured Darvic ring as well as a BTO ring. Eventually it was able to be read and revealed the legend 11 in black lettering. It was discovered he was from the Rutland Osprey Project translocation of 1998, having originally hatched in Speyside. Amazingly another of the Rutland translocated ospreys, White 07, was found to be breeding near Welshpool that summer with a Perthshire born female, Red 6J. They successfully raised one chick, believed to be a male. The Glaslyn pair remained at their nest until the end of August. During the winter of 2004/2005 the RSPB obtained funding to run the project under their “Aren’t Birds Brilliant” scheme, which in later years was to become “A date with nature” and the Glaslyn Osprey Project began to take shape, headed by Gili Armson RSPB Community Links Co-ordinator. 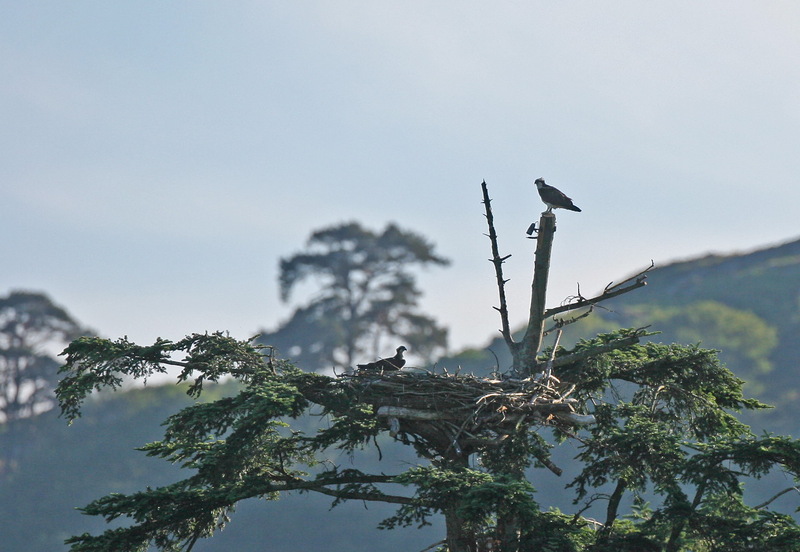 At this time a member of the RSPB staff Conrad Smith, who was a qualified tree surgeon, climbed the nest tree and removed the rotten top section from where the 2004 nest had fallen and built a strengthened nest platform. This was completed with the assistance of the children of nearby Ysgol Llanfrothen, who helped to collect suitable bundles of sticks to form the nest. A CCTV camera was also added so that the nest could be monitored and watched 24 hours a day. 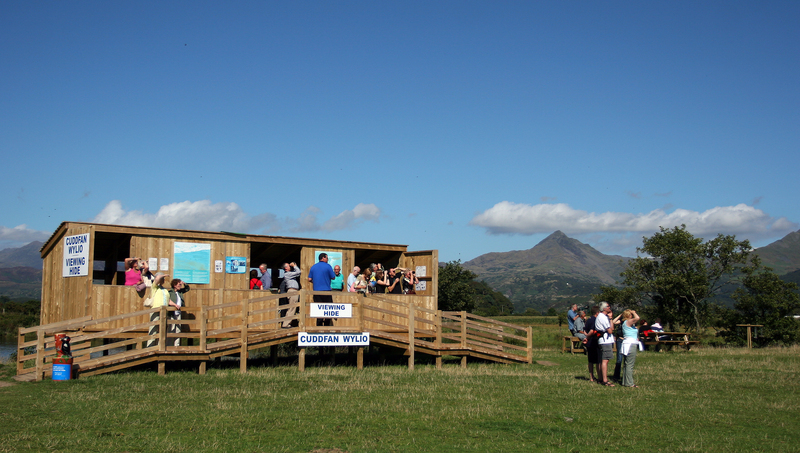 Osprey Project Officer, Emyr Evans was appointed and seasonal members of staff were also employed to protect the nest and show the birds to the public at the newly opened Viewing Centre at Pont Croesor. One of the protection staff was BGGW’s Elfyn Lewis, one of the birdwatchers who first spotted ospreys in the valley back in 2001. The male returned to the nest site on March 28th that year and immediately sat on top of the freshly sawn off trunk above the nest, a perch he has continued to favour over the years. The female with the heavily marked chest that we all recognised from the previous year reappeared on 22nd April, quite late in the season. Just ten days later on 2nd May at 09:50 in the morning the first egg was laid. The event was watched by many eager people in the Visitor Centre. A further two eggs were laid on 5th and 8th May to complete the clutch. The first chick hatched on 9th June at 21:00, followed by the second chick on 12th June. The third egg failed to hatch and remained in the nest until it was collected for analysis the day the chicks were ringed on 13th July. The chicks were given yellow Darvic rings with black lettering. The eldest Yellow 37, a male and the youngest Yellow 39, a female. The virtually indestructible ring with Yellow 38 on it broke! Yellow 37, or Cymro (Welshman) as he was named by local schoolchildren, fledged on 30th July at 12:42 and Yellow 39, Gwalia (an old word for Wales), fledged on 3rd August. They remained in the area until the early part of September. Thus, the Glaslyn dynasty commenced.